Not much of a recipe for you today, but some cuteness. I am not sure if I have ever mentioned how much I love Target and how much time we spend there. A weekly trip to Target is pretty standard in our house. A couple weeks back I saw these adorable bunny shaped pretzels in the Easter section. Seeing the potential, I bought a bag with plans to make these. We don't often buy pretzels, so by the time I got around to making these Zack had eaten half the bag. Apparently he was also excited about the bunny pretzels. All I did to make these was melt some white chocolate chips with a little shortening in the microwave until smooth and then topped with spring colored sprinkles. 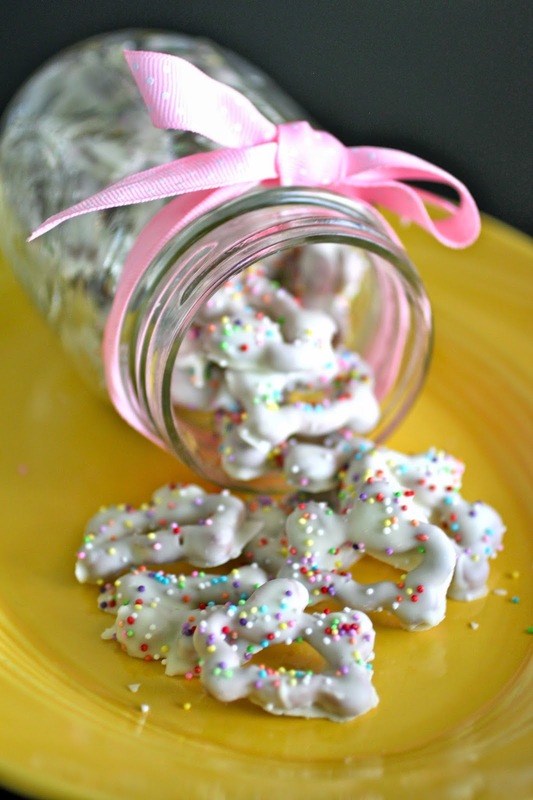 They are super easy to make and I know they would be a perfect addition to an Easter Basket.